— Other than failing to recognize he was supposed to break down a special teams huddle at the beginning of practice and seeming confused when stepping to the microphone at the end, nothing seemed indecisive about Cable’s first day as coach. Cable was told that since he’s the coach, he can do whatever he wants. “Oh, really?,” he said with a laugh. — With systems of football already in place and a quarter of a season in the books, there will be no dramatic changes. One minor change _ the practice of running plays over and over until they get them right that sometimes extended Raiders practices by 20 minutes or more under Lane Kiffin has been junked. “I will say this to you _ we’re going to stay on schedule. Practice isn’t going to run over. If it’s scheduled to be an hour and 35 minutes or whatever it is, it’s going to be an hour and 35,” Cable said. “We’ll get in, get the work done right and get off the field so we can go in, teach and learn, and get better that way. — Rest assured that if Kiffin had to go, the offensive line is on board with Cable as the replacement. Guard Robert Gallery said the “tempo” theme was stressed immediately. — It’s doubtful you’ll hear Cable talk openly about his team’s shortcomings the way Kiffin often did. While falling short of Joe Bugel’s memorable “multiple Super Bowls” forecast, Cable is talking about playing in January. — Justin Fargas is in his sixth season and is playing for his fifth head coach. So he can be excused for shrugging off Tuesday’s events as just another day at the office. When asked if it was the strangest day of his Raiders career, Fargas shrugged. — Fargas, who became a 1,000-yard rusher under Kiffin last season, was sorry to see him go but ready to move on. — Cable doesn’t want any stragglers. He’s not big on team rules. — The Raiders practiced in shells and Cable said the big emphasis was getting in a quick-tempo workout and getting people healthy during the bye week. Guard Cooper Carlisle (ankle) practiced and was limited after being inactive against San Diego. Cable said he thought Carlisle would be ready to face the Saints on Oct. 12. Also limited were S Gibril Wilson (back), LB Isaiah Ekejiuba (shoulder) and RB Michael Bush (quad), none of which are considered serious. RB Darren McFadden (toe) and Fargas (groin) were out, as was TE Ben Troupe (foot) and T Seth Wand (knee). Fargas said he expected to be ready to face New Orleans. — The Raiders practice Thursday before taking the weekend off and returning Monday. Former Raiders defensive tackle Warren Sapp held nothing back in assessing the Raiders situation in his role as an analyst on Showtime’s Inside the NFL. Sapp: Nobody tells you how bad it is. I remember seeing Trace Armstrong after spending my four years there. I wanted to choke the life out of him. I wanted to kill him . . . and then Phillip Buchanon was there. I said, Phil, why didn’t you tell me this? I said, you all did wrong. Because any person that calls me on the telephone, (I tell them) do not go anywhere near Oakland. Sapp: Way unfairly. He came in there with a change of mentality. The whole system. He changed how the locker room looked because it was going to take that kind of overhaul for Oakland to become the proud franchise we all knew it was. Sapp: He is the common equation. You take him out, put him at home watching film or whatever he is doing – you have a functioning football organization. But once he comes over the top, he goes and starts moving it around . . .
Looks like MR is back to posting as me. MR why don’t you just HAVE the Oakglenn name. Obviously, it means more to you than it does me. Actually 408, tard boy just woke up and is posting as me. So sad for him. It really is. That is from an article about John Fassel, Jim’s son back in 2000. John Fassel is now a QC coach for our ST’s. Interesting. That was a nice FF game last week by the way, I was scared that Mendenhall would get a couple of goal line scores, good thing he broke something lol. Thanx Dakota my brother in law is gonna hate it(whiner fan) but my nephew already wears raider gear that I buy him!! Doodz everyone is cordial becauze no one iz bazhing Mr.Daviz! And it better ztay that way or I’ll ztart kicking zome azz! If any of you guys look at the play calling the last three games, you’ll see a first half which is daring, imaginative, non predicatable, but yet tough. Then you see a second half which is boring, predicatable, waaaay too conservative, and predicated on a premise of trying not to lose, instead of winning the battle. Knapp and Kiffin decided to split play calling duties so that opponents could not find discernible patterns to exploit. Guess which one called each half? I defer to Mr. Madden on that point. With an owner willing to pay the price for winning, this team has a lot less obstacles than one might think. OG I thought the lil guy got tuckered out going through the archives last night…but then again he really came up with some good point. Plus he made me take a long, long look in the mirror. I have to admit, we really do shoot off our mouth’s here in faderland. We need to kewl it so people stop laffing at us and make us eat ourword. 408, the poor lil guy has obviously got deep psychological issues. Any grown man that holds on to a 49er blankie as tightly as he does, has serious problems. But if being “oakglenn” can somehow make his mundane existence better, hey, it’s not a big deal for me. After Art Shell took over for Shanahan, none other than Jim Fassel became offensive coordinator for a team that went on to the play-offs the next two seasons before missing them in 1992. In 1993 Tom Walsh, yeah that Tom Walsh became Shell’s OC, and Shell never took the Raiders back to the play-offs during his tenure. Both he and Walsh were canned. are you gonna be OG or 408? dude I like you better as MR..
A WIN is cure-all !! So lets go out n get some !! well… okay… mission accomplished !!! 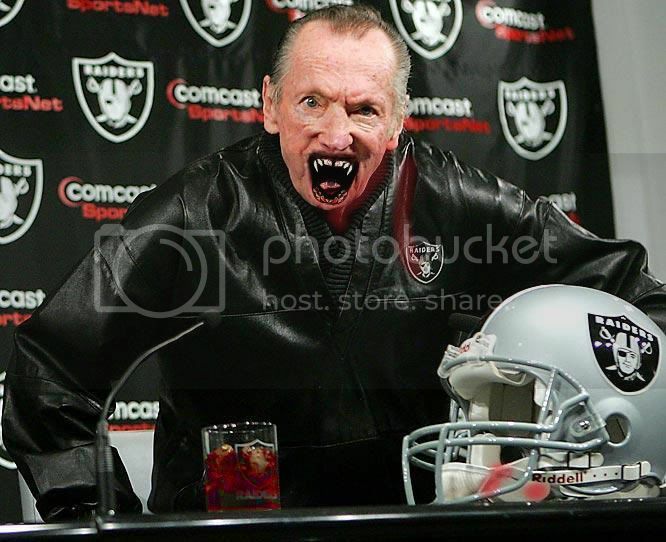 On KNBR they played Al Davis telling his flunky he didn’t know anything about Tom Cable and to get a media guide so he could introduce him. Not exactly a ringing endorsement of Al’s in depth interview. It seems like he got all the coaches in a room and asked anyone ho wanted the job to step forward. Apparently, Cable was the only one who didn’t step backward. Post # 5 Brian you have to be the stupidest meathead idiot thats ever posted on here .Last time they won a Super Bowl was when they where in L.A dont blame L.A blame AL and your momma for not aborting your dumb waste of air a$$ when she had a chance see what inbreeding does it brings retards like u into this world and on here posting garbage.